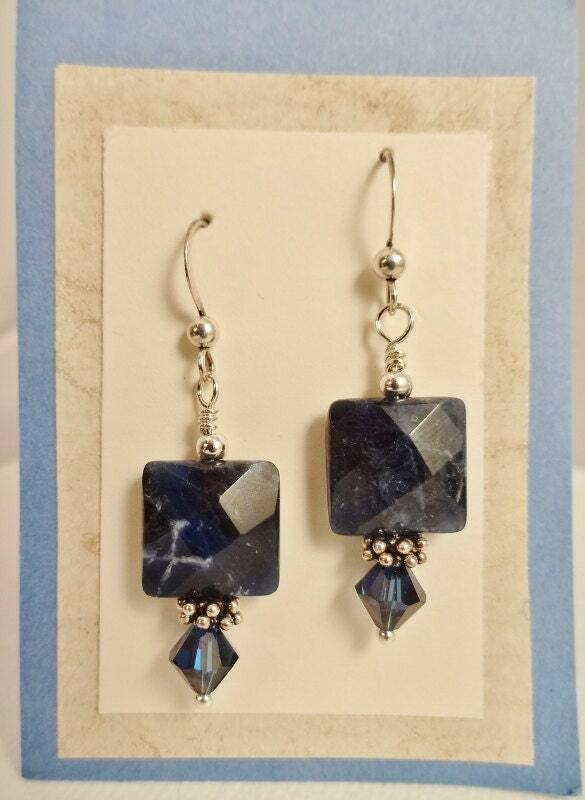 Sodalite is a versatile navy blue stone, one you can wear with a navy blue business suit or your favorite blue jeans. These earring feature faceted Sodalite Squares with a 6mm Swarovski bicone on the bottom separated by sterling silver daisy spacer beads. Wikipedia says: Although somewhat similar to lazurite and lapis lazuli, sodalite rarely contains pyrite (a common inclusion in lapis) and its blue color is more like traditional royal blue rather than ultramarine. It is further distinguished from similar minerals by its white (rather than blue) streak.